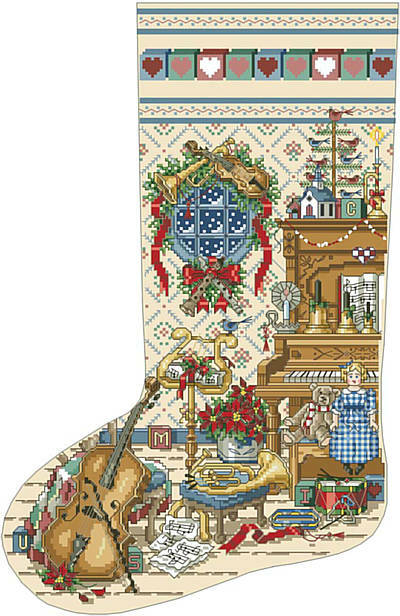 This delightful stocking features a Victorian-inspired music room complete with a violin, piano, trumpet, cello and other instruments. Placed on a fireplace mantle the vintage colors and a musical theme lend a 19th century charm to any holiday decor. Sure to be a memorable Christmas gift for teachers, coworkers, friends or family on your holiday gift list. A must-have for your favorite musician! Contents: Stitch count 136w X 207h, finished size on 25-ct over two threads 10-7/8" X 16-5/8"